AAB - Academic Achievement Battery Screening Form : Ann Arbor Publishers, leading suppliers of learning materials to psychologists and allied therapists of all disciplines - specialist teachers and parents from the UK and Worldwide. The AAB Screening Form measures basic academic skills, including letter and word reading, spelling, and mathematical calculation. It features reliable change scores adjusted for practice effects, an analysis of discrepancies with various measures of IQ, an optional writing subtest, and covers a broad age range. 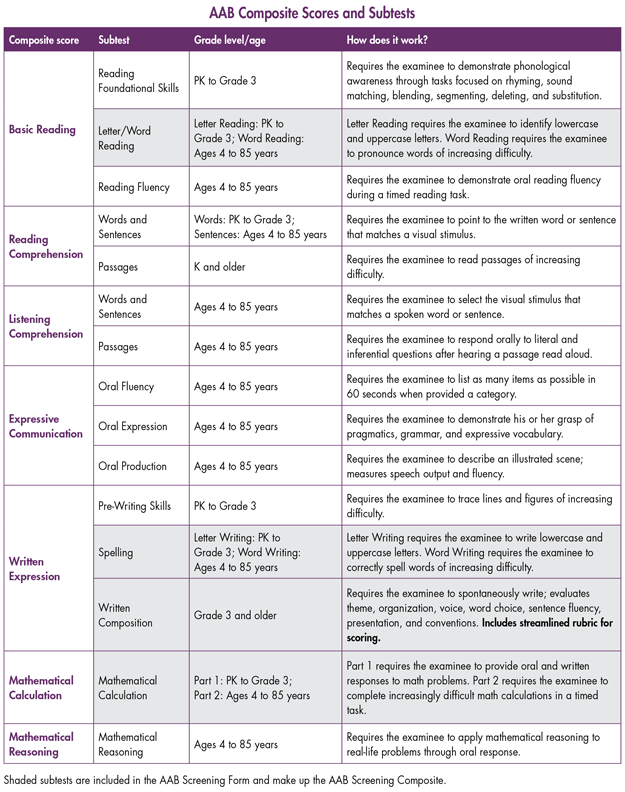 Developed using academic standards set by the National Council of Teachers of Mathematics, the National Council of Teachers of English, Common Core, and Reading First. Administration and scoring are straightforward and easy—and both versions have a Fast Guide to help you get started. Unlike similar measures, the AAB requires no certification or intensive preparation—simply open your AAB kit and review the materials, and you will be ready to begin assessment. Provides age- and grade-based (Fall and Spring) norms. Scoring is available through PARiConnect; stimuli are available digitally. Can be administered in 15-30 minutes and scored in 5-10 minutes. All four subtests are included in one easy-to-use response form. Measures basic academic skills, including letter and word reading, spelling, and mathematical calculation. An optional written composition component requires an extra 15 minutes to administer. A composite score provides the user with a snapshot of the individual’s performance in reading, spelling, writing, and math. Appropriate for evaluating fundamental academic skills during an initial evaluation, during reevaluation, or when working with those referred for learning, behavior, or vocational concerns. Reliability coefficients for the subtests range from .77 to .97 and from .88 to .98 for the composite scores across the age- and grade-based normative samples. AAB subtest and composite scores were found to be highly correlated with similar constructs on the WJ® III, KTEA™ -II, WRAT4, and WIAT® -III. The manual includes evidence supporting the ability of the AAB to differentiate performance in individuals with various learning disabilities, intellectual developmental disorder, ADHD, and speech/language impairment.